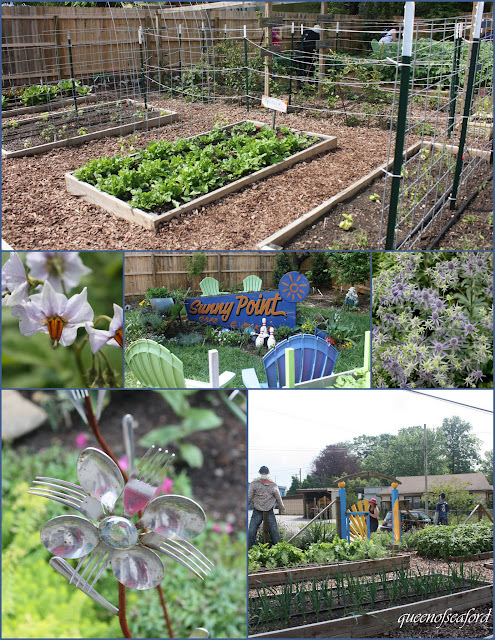 From Christopher Mello's garden we went to Barton Street Community Peace Gardens. 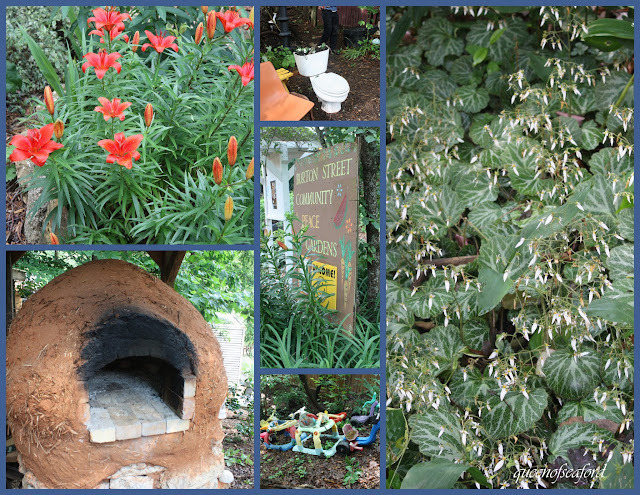 It was a mix of veggie garden, recycled material art and a beehive pizza oven. A most interesting place, truly a community project. I would love a pizza baked in this oven!! So cool. Asheville has so many interesting gardens tucked in small spaces. Many eating establishments offer locally grown food on their menu. Sunny Point Cafe has a beautiful vegetable garden just outside its backdoor. See the potato blossom on the left side? Same shaped bloom as Borage, tomato, and Shooting Star. We had light refreshments at this garden. I have to tell you about the most refreshing drink I have had in a long time...fresh ginger and lime, a ginger-lime-ade. I enjoyed it so much. From the cafe gardens we traveled to our luncheon destination. Have I mentioned how much I have been enjoying Asheville? The River Arts District was our lunch stop and lunch was catered by 12 Bones, super barbecue! Ice cream was offered by The Hop, yummmmy!! The gardens had some interesting conifers, beautiful plantings, and a peaceful place to sit and enjoy our lunch. Whipcord Arborvitae, low growing evergreen. Perfect for the front of a garden. A sweet little Allium added some color with all the evergreens. Cyclamen leaves nestled in the irises. As with many of our stops, I wish we had more time to explore this garden and the art studio. Love the rustic sitting area. The pottery was so lovely. It is time to move on to the next stop, NC Arboretum. We were offered a guided tour through the arboretum with Tim Spira, professor of botany at Clemson, author of Wildflowers and Plant Communities of the Southern Appalachian Mountains and Piedmont. He shared lots of information on the Oak-Hickory forest. There were many varieties of hickory- to include Pignut Hickory Carya glabra, Mockernut Hickory Carya tomentosa. It was a wonderful tutorial through the forest. In addition to the native trees, the native mountain laurel, Kalmia latifolia, was in full bloom. This variety is special because of the flowers being mutants, have a Chrysanthemum look to them. I always thought the flowers were the pitchers. Never read much about them until now. Finally we went to B. B. Barns Nursery to finish a very full day! Stay tuned for the next installment of this garden filled trip. ©Copyright 2012 Janet. All rights reserved. Content created by Janet for The Queen of Seaford. words and photos by Janet,The Queen of Seaford. 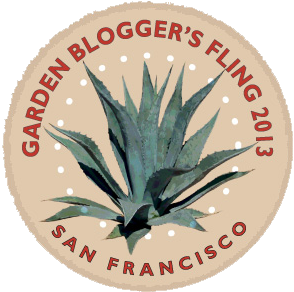 Our second garden on the first day of the Fling was Christopher Mello's garden. The dominant foliage color is burgundy. I love burgundy foliage plants, my eye is always drawn to them. Welcoming us at the gate was a lovely Ninebark, Physocarpus opulifolius. This native shrub was a dark foliage variety. It could be 'Diablo', or 'Seward' or 'Summer Wine' or something completely different. I have 'Coppertina' in my garden. This magnificent sculpture was just inside the gate...winged baby heads....brilliant! The rust elements compliment the burgundy foliage....the blue heads...well, they go well with the color of some of the blooms and of course the blue bottles. This is a Purple Leaf Birch, it is just beautiful. These beautiful plant choices shine in this garden. There is one blooming plant that really has the spotlight, Mother of Pearl Poppy. Christopher is doing some selective harvesting, letting those that are blue reseed. The bees seem to like it! Doesn't this look like crepe paper? What a great poppy! 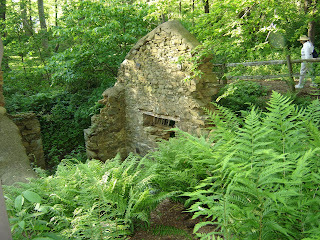 And I did mention rust and blue bottles....the 'bones' of the garden. Old shovel heads on re-bar. and finally....blue bottle trees, all over the garden. Stay tuned for more Spring Fling events .....these last two posts were just the first morning!!! This past weekend was my first Fling. What is a Fling? 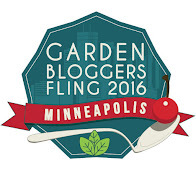 Guess a fling is many things, my Fling was an event for Garden Bloggers. A little over 90 of my fellow garden bloggers and I met in Asheville to take in as much as possible in a short period of time. Our planners arranged for so many wonderful gardens to visit that it can't all be shared in one post....or two, or three. Please stay tuned for the whole weekend's amazing events. There were many sponsors for our Fling, each contributing in some way. If you were lucky enough to get to Asheville early enough on Thursday, the first stop was an open house at Sow True Seed. Mikey giving us a guided tour through the facility. Inside the cold room. The seed organization is incredible. Not only a guided tour of the facility, we also got some great munchies! We had a meet and greet that evening...so many people!! It was hard to know who everyone was. This weekend was going to be amazing. It was an interesting garden. It was sort of Alice in Wonderland meets......um, The Grave Digger? This garden had some of the most interesting artwork throughout the grounds. The owners, Damaris and Ricki Pierce, are artists, each putting their unique touch in the garden and together they have created Wamboldtopia. Love is in the air...?!!? This was truly an adventure in whimsy. I appreciate many aspects of this garden, though somehow, the bones wouldn't make it in my garden. Stay tuned for our next stop....Christopher Mello's Garden. This past Monday (two days ago) we had a lot of rain in a very short period of time. It was 2 1/2 inches in about 45 minutes. Since it was late in the evening we had to wait until the next morning to see what this gully-washer did. For those who are new to the blog, I live on a sloped lot. The top of the street the elevation is 480 feet above sea level, the house is about 465 ft. and the lake is at 440 ft. Downhill all the way to the lake. The picture below shows a lot of the washout. Lost a lot of the leaf litter and a lot of the top layer of soil. The pathway lost a lot of mulch too. There are a lot of tunnels throughout the hillside. Who makes them? Moles? Snakes? Chipmunks? Lizards? Who knows. I have lost a few Echinacea but not much else, so not 100% sure it is Moles & their little friends the Voles. This is a Canna Calla (oops) Lily that is just about to bloom....see all the roots exposed? There were a lot of roots exposed all through the garden. Poor little borage had all its soil washed away, all that was left was the potting mix and the plant laying on top of the soil. I replanted it quickly. Crossing my fingers on it. The other little babies that got carried away by the rushing water were some small Blackberry Lilies, Belamcanda chinensis. These little guys got replanted tonight. I shoveled some washed out soil over the exposed roots as well. Once I get back from Asheville I will figure out what else I need to do. As for the Gardenia bush that fell over....I dug it up and replanted it. There was no root damage. It was just top heavy. I pruned it back a good bit and anchored it with a couple heavy rocks from the driveway. Will have to keep it pruned lower until the root system is larger and stronger. Now for the good....a quick overview of the goodies in the garden. The red roses are blooming and really pretty...but I have to show you, it is a small shrub. At this point I am just glad the deer haven't eaten it! Catmint, Nepeta racemosa Walker's Low is truly a pollinator magnet. The activity was amazing! Lots of bumblebees, nary a honey bee. Lucky for me, the Yorktown Onion didn't get washed away, it was right next to the water's pathway. The Edgeworthia chrysantha are super happy. Love their large leaves. And finally, a little Cuckoo...made an ID on a bird that we have heard in the trees, and finally today, I SAW IT!! To top it off...I got a picture too. This is a Yellow Billed Cuckoo. Here is the sound he makes. 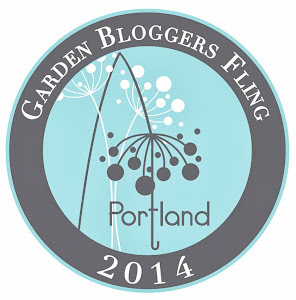 Tomorrow I leave for Asheville for the Garden Bloggers Spring Fling. Stay tuned for updates!! Who Is Knocking Over My Shrubs? ?